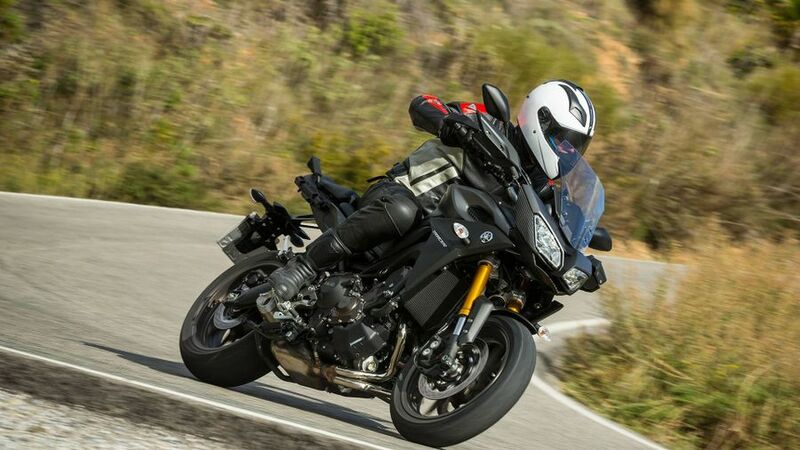 This excellent sports-touring addition to Yamaha’s MT family is a contender for bike of the year. 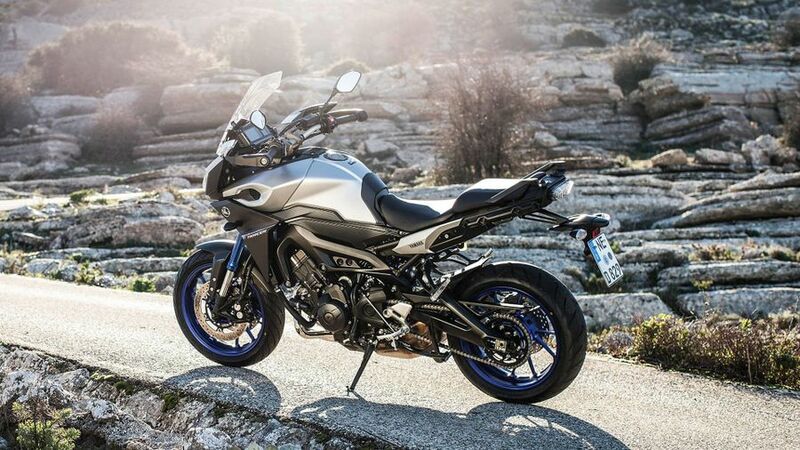 The Tracer combines the flexible engine performance and agile handling of the standard MT-09 with sharp styling plus a big extra chunk of wind protection, comfort and practicality. And for such an outstanding all-rounder it has a temptingly accessible price. 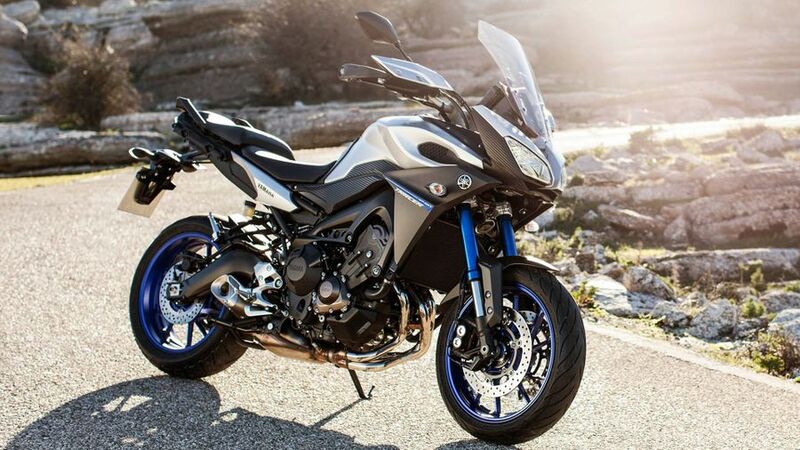 Interested in buying a Yamaha MT-09? The Tracer’s one-piece handlebar, whose position can be adjusted slightly by reversing its clamp, is wider and slightly higher than the standard MT-09’s. 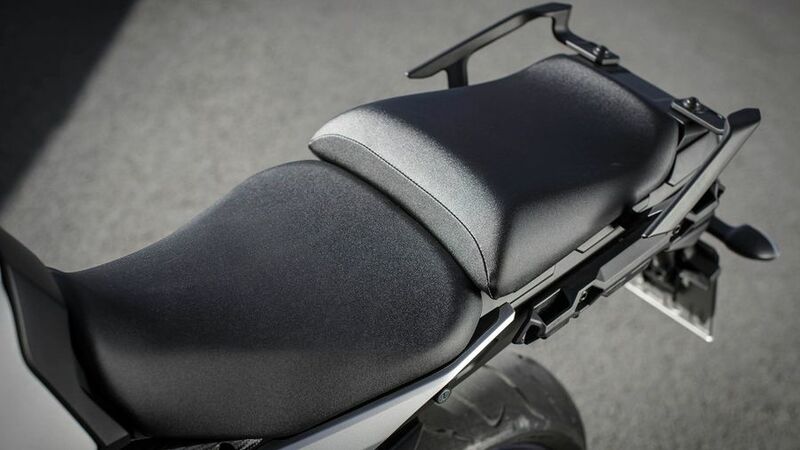 It gives a roomy and upright riding position, in conjunction with a seat that is considerably broader and thicker than the naked triple’s, and which can quickly be adjusted for height between 845- and 860mm. (For shorter riders there’s a lowering kit of seat and rear shock linkage that reduces seat height to 815mm.) The screen is fairly small but broader at its top, and is adjustable by hand after you’ve loosened the pair of plastic knobs on either side, a solution that is functional if not as elegant as the one-handed adjustment offered by some rival sports-tourers. I found the upright riding position comfortable and was fairly impressed by the screen’s protection. But the combination of my height (6’4”) and the screen’s modest 30mm of adjustability meant I couldn’t eliminate wind noise completely. The Tracer scores highly here. It’s essentially designed to be a more practical version of the MT-09, and is exactly that. It’s not just a modified naked bike but a proper, purpose designed sports-tourer, with wind protection, fuel range, comfort and some handy features. Some sports-tourers are even more lavishly equipped, but the Yam’s light weight and manoeuvrability also contribute to its appeal for everyday riding. Most of the Tracer’s practical aspects are well thought out. Fuel capacity is increased from the MT’s 14 litres to 18 litres. Many owners of the naked MT-09 average 50mpg or even more, which would give the Tracer a realistic range of 175 miles or better. Fuel consumption is shown on the comprehensive display that can be toggled via a switch on the left handlebar. Mirrors are slightly narrow, but practical touches include easily adjustable headlights, plus a 12V socket and centre-stand as standard fitment. The flexible 12-valve engine is strong enough to be very reminiscent of the MT-09’s, pulling from below 3,000rpm, then displaying much of the storming midrange and rev-happy top-end performance that have made the naked triple popular. 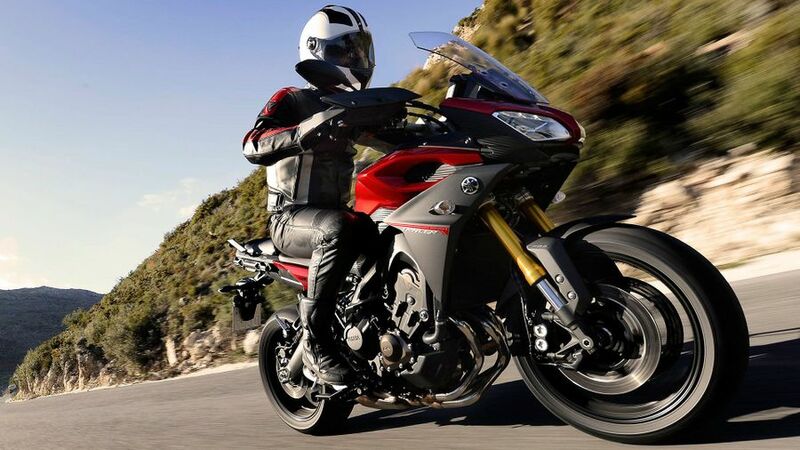 The Tracer’s ride-by-wire throttle response has been toned down slightly from that of the original MT, as Yamaha have already done with recent production of the naked triple. Like that basic model MT, the Tracer has a standard riding mode plus sharper ‘A’ and softer ‘B’. But the sports-tourer’s response is slightly softer in each one. It feels almost as though this bike’s ‘A’ mode is the equivalent of the original middle setting. In ‘A’ mode, there’s still sometimes a slight abruptness to the response, so the set-up isn’t quite perfect, but provided the throttle is used smoothly this is barely noticeable. The Tracer’s crisp acceleration is a big part of its appeal, although it can’t quite match the naked MT’s ultra-lively feel. Under hard acceleration there’s a slight tingling through the seat and footrests, but that isn’t a problem and on a steady throttle the Tracer is very smooth. There’s plenty of stopping power, thanks mainly to a front brake that combines radial four-piston front calipers with 298mm discs, and incorporates an efficient ABS system as standard. Handling is excellent, with a good balance between stability and agility. Light weight is part of the reason for that; at 210kg wet the Yamaha weighs substantially less than rivals such as Honda’s Crossrunner and Kawasaki’s Z1000SX. 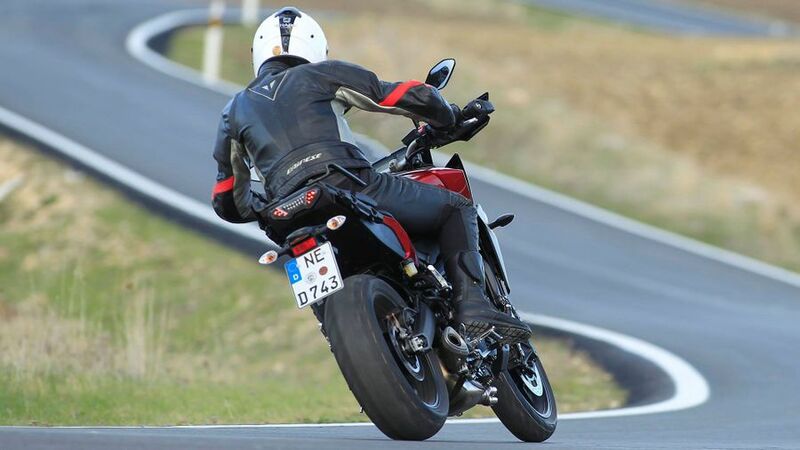 The Tracer takes its steering geometry from the MT-09. It also shares the naked model’s fairly generous suspension travel of 137mm up front and 130mm at the rear, although spring and damping rates are increased at both ends. That’s partly to cope with the sports-tourer’s extra weight, but the damping levels seemed better chosen, giving the Tracer a more controlled feel from its front end when cornering. Predictably, the Tracer can’t quite match the 20kg lighter naked MT-09 for agility, but for a sports-tourer it’s impressively manoeuvrable and fun to ride. Its generous fork travel means that it steers more sharply after the 41mm forks have been compressed by hard braking. The travel comes into its own on bumps, where it contributes to an impressively high level of comfort. Dunlop’s D222 tyres normally gripped well although dusty Spanish roads triggered a couple of small slides. It was hard to be sure how much assistance was given by the traction control system, which can be deactivated. It’s a fairly basic, non-adjustable system but is surely worth having. 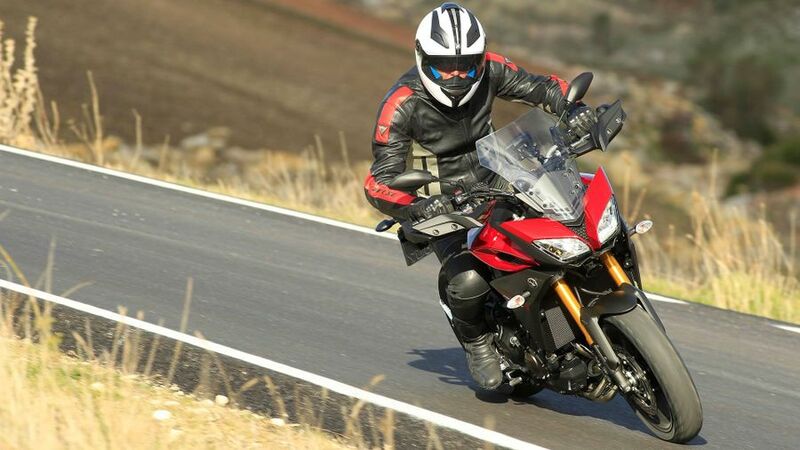 For a bike of this level of all-round performance the Tracer should prove relatively inexpensive to run, partly simply because of its light weight, which reduces strain on tyres and brakes. The MT triple engine is impressively economical, with some owners getting well over 50mpg, and even hard use seeing mid-40s figures. It comes with Yamaha’s standard two-year, unlimited mileage warranty. Minor service intervals are not exceptional at 6,000 miles, and major ones at 12,000 miles, but the valves need checking only every 24,000 miles, so few owners will need to worry about that. In some ways the Tracer is all about equipment, because its fairing, adjustable screen, hand-guards, big petrol tank and generous dual-seat are the key features that differentiate it from the standard MT-09. Most of those parts work well although the screen generates some turbulence (at least if you’re tall) and the hand-guards don’t keep off all the wind – on a cold day my hands were soon suffering. But it’s hardly fair to complain too much because there’s a 12V socket on the dashboard, for plugging in accessories, and heated grips are an option. 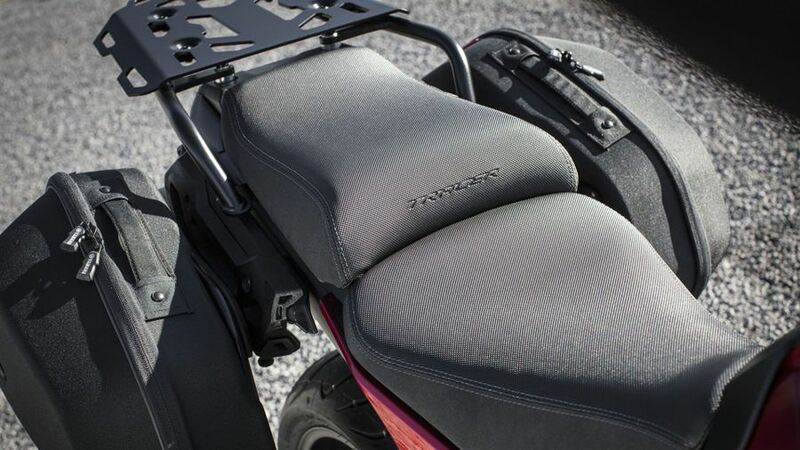 The dual-seat is wide and well padded, especially so for a pillion who also gets grab-handles at either side. The seat’s easy adjustability means that tall riders can gain legroom by putting it on the higher setting. There’s no cruise control, but along with hot grips there are plenty of other useful accessories, including a taller screen, semi-rigid panniers, top-box and additional 12V socket. Sportier options include LED indicators, aluminium billet levers and footrests, and an Akrapovic pipe. 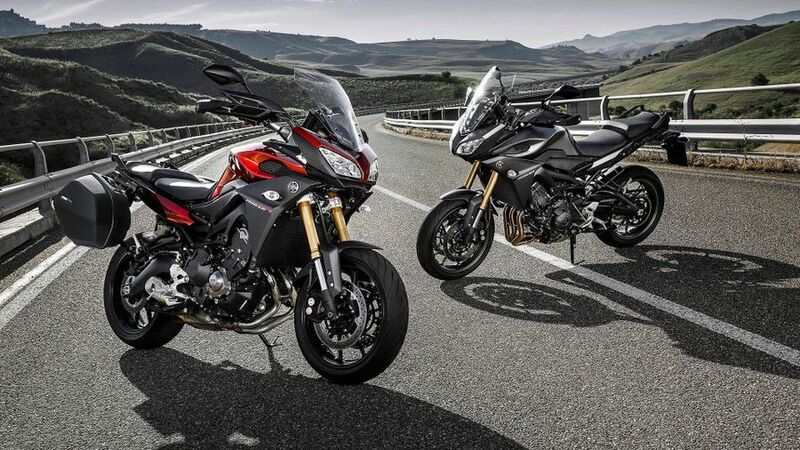 This year we’re seeing an extraordinary array of new multi-purpose bikes, with machines including BMW’s new S1000XR straight four, Honda’s updated Crossrunner V4, KTM’s novice friendly 1050 Adventure V-twin and Triumph’s Tiger 800 XRx triple, not to mention Ducati’s revamped V-twin maestro the Multistrada 1200. The Tracer can’t approach the much more powerful XR or Multi for performance or glamour but at little more than £8,000 it costs significantly less than all those others, never mind the much more expensive BMW and Ducati. Yamaha’s tall triple is maybe not the dream purchase, but in value-for-money terms it looks very hard to beat.